I love the work done by Steven and the rest of the folks at RCFG. However, as someone who needs waist of 30 and thighs of 12.3-12.5, almost none of the Railcar bottoms fit me. I could size up in the James fit but the measurements won't be perfect. If there are others among you who face the same issue, please tell us here. Maybe, if there are enough of us around, Steven will have a reason to make pants in a Relaxed or Athletic cut. We just reactivated this board. But our Journeyman fit is what you need. @steven Yep, it's almost like you heard me. Since I fall exactly between size 31 and 30, I am wondering which one to buy. Size 31 has a waist of 32 after shrinking while size 30 has a waist of 30. I am waist 31. 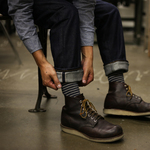 1) I would love to see the journeyman fit in Cone Mills natural indigo 16 Oz. 2) And the journeyman man fit in flight trousers. Oh, I didn't know about the Journeyman fit! Very exciting. I've been trying to get my bf to check out "real" jeans (he always buys a crap pair for $20 and then wonders why they're crap). A big obstacle has been a lack of non-skinny jeans for men. My bf does a lot of walking on hills, and has muscular thighs. (Why are decent jeans always cut for ultra slim guys?) I'll let him know about the journeyman fit! Also looking for high rise jeans for curvy girls (not overweight, just with small waist/big hips). I really liked the Donna overall, even if it was cut for a somewhat less curvy physique. Only thing I didn't like was the coin pocket all by itself away from the front pockets, but this is a minor quibble. I hope there will be more high rise options, as I *LOVE* my vipers but they really are too low for me to be very active in them. I need jeans to be held up by my hip bones, not fall just below the hip bones where there's nothing to hold them up. Okay, he is interested in trying them on! Where can he go in the Los Angeles area to try them on? He's in the West SFV area.